In a quest to find the perfect job for ourselves, what we mostly do is keep rejecting offers that were too close to our dream job as well. We are so engaged in looking for a job that we don’t even see where we are going wrong. We are applying for the job that we feel we are eligible for, but nobody is calling us back. What is the thing that we are not doing correctly? Have we ever sat back and tried to realize that? No, instead we are keeping on repeating our mistakes. You might be coming in your own way of acquiring the perfect job for you. You might be great student all throughout and you have been doing great at your internship as well. But that doesn’t mean you will start your career as a manager right away. There is no problem with aiming high, but you must have realistic goals that are achievable. If you demand something outrageous, then you might end up losing the job to someone who is less qualified than you. There are many people around here who feels that they can handle this all by themselves. If you are amongst them, then you are highly mistaken. You have been applying for job in so many places, but they haven’t responded to your application yet. It means that you might have gone wrong somewhere and that place might be your resume. Ask someone to help you out with your resume by proofreading it. They will be able to pinpoint the errors that you have missed out. If you can hire someone professional, then nothing can beat that. In case, you are getting rejected in the interview process, then set up a mock interview with your friend and he will be able to point out your flaws. This can be tricky, because in case you are talking too much about the woes of job search, then it might seem that your behavior is too negative and if you are not talking about it at all, then the chances of receiving some kind of a help is almost zero. When you are submitting the resume and cover letter, then it is up to the hiring manager to schedule an interview date with you. You cannot assume the responsibility of arranging the interview all by yourself. If at the end of the cover letter you are stating that you would be calling up next week to schedule a date and time for the interview, then you are definitely overstepping the boundaries and sabotaging the job search of yours. Rather than coming up with some generic lines like I am the best fitted candidate for the job, it will be far better if you add your accomplishments of previous job in your resume. It will sound more convincing and less pushy. At the end of the interview, the interviewer asks the candidates whether they have any question for them or not. At this point of time if you are asking them whether you have been hired for the position, then it will be a blunder. By doing so, you will be putting the interviewer on the spot that most of them will detest. Try to end the interview on a happy note and it will help you in the long run. You will have to create a personal brand of yours in this mobile society. Now, things go beyond the physical resume. You now have to make your presence felt in the online world as well. Google your name and see what information is popping up. Update the social networking accounts with your skill set and experience that matches your resume. If both of them don’t sync with each other, then you are getting it all wrong in here. In the job description, you will find that some skills are there, which is a must have for the candidates. If your skill set matches them, then only apply for those jobs, else you would never be called for the interview. When you are preparing your resume, clearly mention the qualifications, so that everybody can have a quick glance at it and pick you up for the position. If you are not doing so, then you are losing out on a big time. 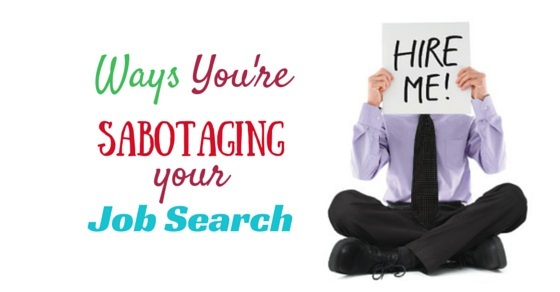 If you are turning down job offers that are quite close to your dream job, thinking that your dream job will turn up soon, then you are sabotaging your job search a great deal. What if the perfect job never came along? You will be left unemployed if you keep on turning down the offers that you are receiving. Networking is important if you are looking for a job, but on the face, aggressive networking might kill your chances. No matter how desperate you are to land up a job, networking will take its own sweet time in flourishing. Therefore, it is important that you engage in productive networking and wait for the right time to request new connections. If you have been unemployed for a long time and still not able to figure out where you are going, then take some moment and retrospect. Ensure that you have set yourself up against realistic expectations. Ask for appropriate help and evaluate the job search effort of yours, this will help you in deciding whether you are treading the right path or you need to steer clear of the way and opt for a new direction. Just remind yourself that if the current strategy is not working, then it is time for a change. Next articleWhy Personality Tests are Important for your Resume?